Alpha is the world leader in the development, manufacturing and sales of innovative materials used in the electronic assembly process. 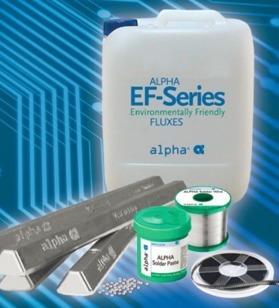 Alpha is a full line supplier of Solder Paste, Solder Preforms, Stencils, Liquid Soldering Flux, Soldering Alloys, Cored Wire, Surface Mount Adhesives, Electronic Cleaners and Sinter Technologies that serves a wide breadth of industries such as electronics assembly, power electronics, die attach, LED lighting, photovoltaics, semiconductor packaging, and automotive. Alpha and smartTec have enjoyed a successful partnership for many years with smartTec’s Nordic division supplying Alpha products across Denmark, Sweden and Norway. This successful relationship was extended last year to Germany and Austria to create an unrivalled level of customer service and technical support in these countries. smartTec as a tier one channel partner of choice for distribution for the complete range of Alpha Soldering materials. Our central stock in Rodgau, close to Frankfurt holds a comprehensive selection of solder alloys, pastes, wires and preforms are readily available to suit every market sector and application requirement.